Illustrated with superb archive photographs, this gift set explores the history and key manufacturers of tractors around the world. Although there has always been much interest in classic or vintage cars, vans and trucks the awareness of the old tractors took longer to evolve. When it did, in the latter part of the twentieth century, the interest was phenomenal and worldwide. This led to an appreciation for the character of these special old tractors and recognition of the importance of the hulking ironmongery of a bygone era. 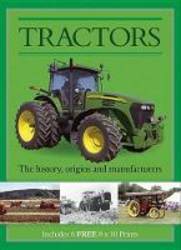 This book looks at the history of the tractor and key manufacturers around the world, and is illustrated with superb archive photographs. Read the history of classic tractors in this beautifully illustrated presentation wallet which contains a 64 page full color book and six ready-to-frame 8x10 prints.